China’s President Xi Jinping is here to stay. The new lineup for the Chinese Communist Party’s all-powerful Politburo Standing Committee (PBSC) was unveiled Wednesday, without a heir apparent to Xi, who analysts predict will continue dominate the country’s politics for decades to come. Of the five new faces in the seven-member committee, the youngest will be 65 in 2022 — when Xi finishes his second term as leader — just three years off the informal retirement age for top officials. He predicted Xi will “remain in some form of power probably until he dies,” pointing to Deng Xiaoping, who retired from official positions but remained “paramount leader” until his death in 1997. Xi himself was 54 when he joined the standing committee in 2007. Chen Min’er, 57, a rising star in the Communist Party, was admitted to the 25-member Politburo, one rung below the PBSC, but not the top body. The new standing committee line-up was revealed in a highly choreographed ceremony at Beijing’s Great Hall of the People. Xi and Premier Li Keqiang, the only members of the previous standing committee not to retire, were joined by Li Zhanshu, Wang Yang, Wang Huning, Zhao Leji and Han Zheng. The standing committee remains entirely male, with the Politburo including only one woman (down from two) Sun Chunlan, maintaining an almost complete lack of female leadership in China. 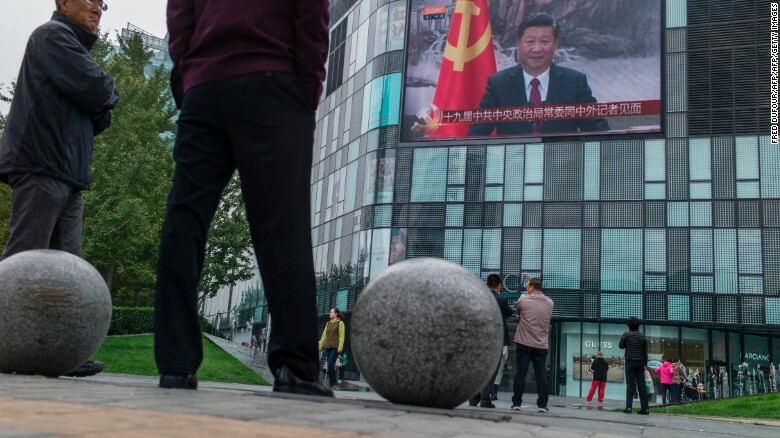 The announcement follows the end of the Communist Party National Congress, the biggest event in China’s political calendar, which is held every five years. “Over the past five years we have set out a broad agenda, some tasks have been completed while others need more work,” Xi said after introducing the new committee. “With decades of hard work, socialism with Chinese characteristics has entered a new era,” he said, in an apparent reference to Xi Jinping Thought, which was enshrined in the party’s constitution on Tuesday, only the second time in history a living Chinese leader has had their authority recognized in this way. Residents watch a large screen showing Chinese President Xi Jinping revealing the new Politburo Standing Committee, the nation’s top decision-making body at the Great Hall of the People in Beijing on October 25, 2017. Several Western media organizations, including the Guardian, were excluded from attending the ceremony, the newspaper reported. “Using media access as a tool to punish journalists whose coverage the Chinese authorities disapprove of is a gross violation of the principles of press freedom,” the Foreign Correspondents Club of China said in a statement.